Forum Index > Makers and Manufacturers Talk > Jesse Belsky StageSwords Holiday Sale!!! Posted: Thu 27 Nov, 2014 9:24 am Post subject: Jesse Belsky StageSwords Holiday Sale!!! 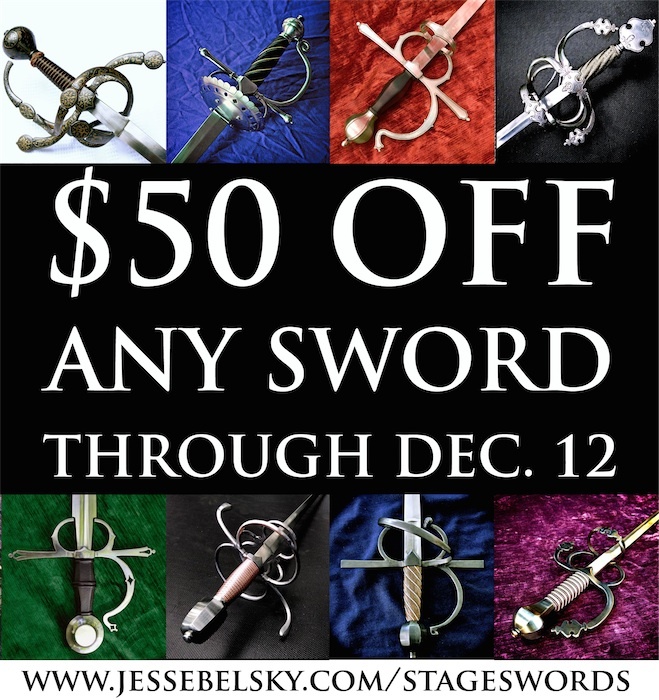 Take $50 Off the listed price of any in-stock rapier, smallsword, broadsword, cutlass, etc. The sale does not apply to knives. Good through December 12. Posted: Fri 13 Feb, 2015 6:40 am Post subject: Jesse Belsky StageSwords Holiday Sale!!! I wonder if your aluminium-bladed swords are sharp or not, Jesse. Anyway, those pirate cutlasses look great. Thanks Shahril, I'm glad you like them. Most of that set went off to the Colorado Shakespeare Festival, although I do have several aluminum cutlasses still in stock. All the aluminum-bladed stuff is for stage or film combat. None of it is sharp. Aluminum is very lightweight, and the stuff I use, 7075-T6 is very strong (its the stuff they use in airplanes), but it's not at all hard/durable in terms of edge holding. So you'd never make blade out of Aluminum. Since it's so light you can make a blade that has a really fat and durable edge, but is still lighter than a steel blade of the same profile.